My wife grows orchids. It's a serious enough hobby to require some interesting constructions. 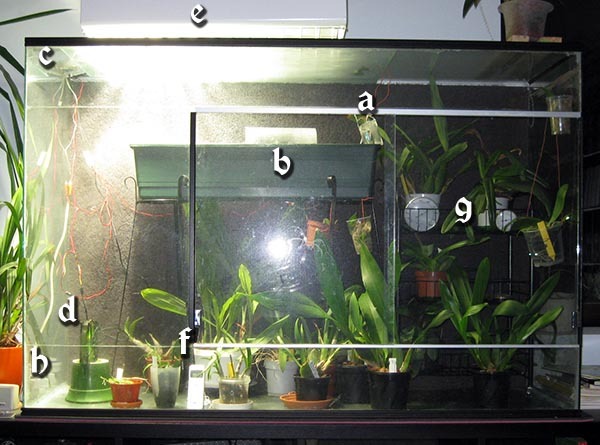 The biggest so far is the vivarium in our living room. The most fun bit is the whole moisture generation thing. We have a pool of water, in which we have a ultrasound fog generator. The mist is cold. 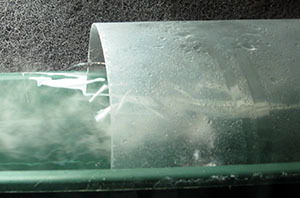 To keep the water surface level high, the mist generator sits on top of a block of glass. There's two reasons to keep the water level high: the water, just by sitting there, keeps the moisture up (remember, the 400W lamp is shining right at it), and the mist is easier to blow away if the water level is close to the edges of the pool. 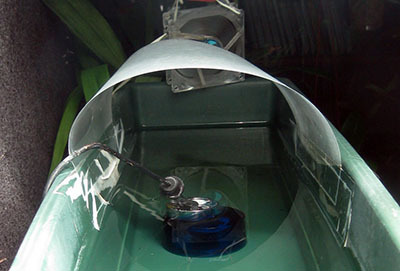 To get the mist out of the pool, a fan blows on the water sideways. One of the less desirable behaviors of the fog generator is that it also sprays water straight up. The function of the cover is to stop those waterdrops from escaping. 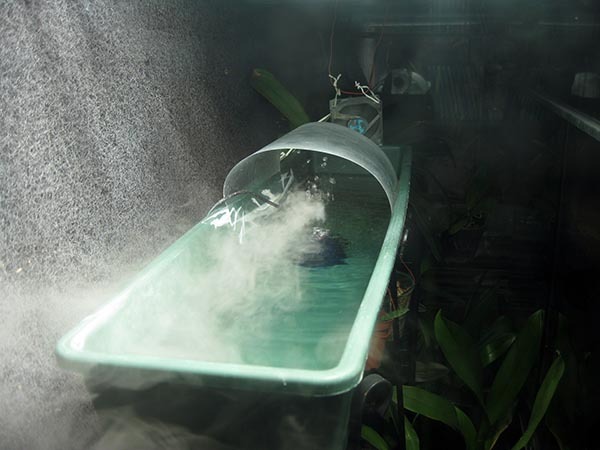 Before installing said cover, the bottom of the whole vivarium would get wet and the pool would have to be re-filled all too often. 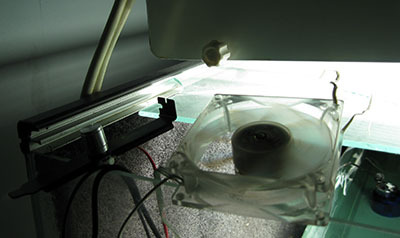 The cover is a simple transparent film usually used for presentations, attached using some transparent sticky tape. When the fog is generated, it gets blown sideways, and then downwards by the top fan. The top fan, like the first fan that blows at the fog generator, is simply a small PC chassis fan. To power the fans I took apart an old Ericsson phone 12V power adaptor. Next to the top fan you can see the speed adjustment knob for the big fan. 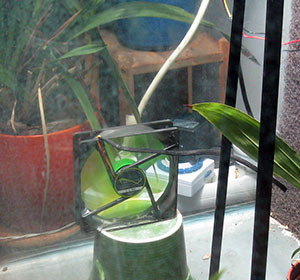 The big fan near the floor blows the fog back the other way, distributing moisture to the whole box. The big fan speed has been adjusted so that the fog (and air in general) moves around the whole box counter-clockwise. The whole thing is automatically turned on and off using timers. 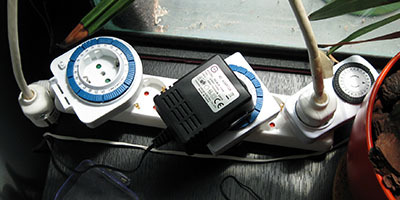 The fog generator is only on 15 minutes at a time out of every hour or so, and the lamp is turned off during the night.